Yesterday your love showed up with force. 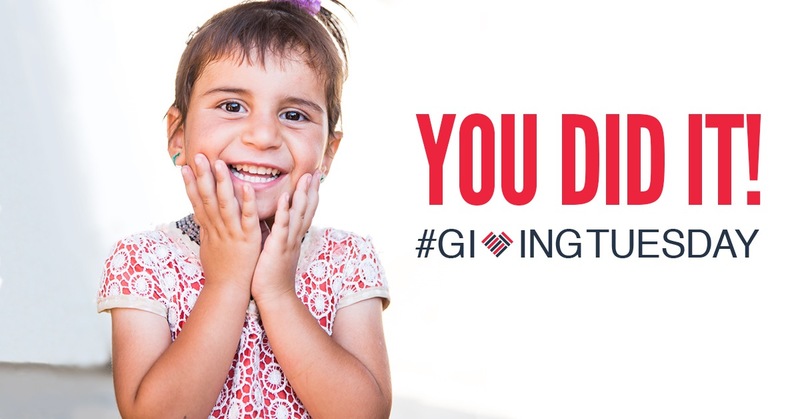 On #GivingTuesday, you gave $146,969 for families in Syria and Iraq!! That money will not sit in the bank for long. We’re already preparing to go into Aleppo, into Mosul, and into other ISIS- and war-ravaged places throughout Iraq and Syria, with lifesaving aid. Without you, that aid would never have gotten to the families who need it most. That’s because you show up where others don’t. Right now, the money you gave yesterday is being spent in places that others have deemed hopeless. But to you, they are anything but. You proved yesterday that despair, violence, and hopelessness do not have the last word. Love goes to the hard places—and this week it will be accompanied by food, water, and shelter to keep children warm through the winter. Stayed tuned for more updates from Aleppo, Mosul, and everywhere your generosity is being put into action to help the most vulnerable. Thank you. We cannot wait to see how you will continue to show up for families as we plan big things in 2017.